Generational cultures, wrote Karl Mannheim in 1923, are shaped by different life experiences. Selim Shahine muses on what this means for the Egyptian uprisings. 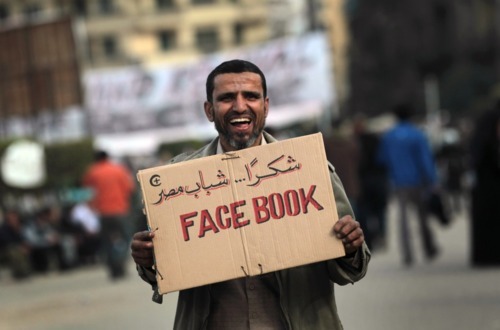 “Shabab al Facebook,” the Youth Movement, the Internet Generation–these phrases are widely used to describe the the people who started the revolution. “Egyptians of all ages express their admiration for the shabab (youth) and their revolt, and define themselves in relation to that revolt,” writes Selim Shahine. In “Youth and the Revolution in Egypt” published in the February edition of Anthropology Today, Shahine reflects as a member of the 1960s generation on the cultural differences between those born in the waning years of Nasser and those born and raised under Mubarak. Shahine draws on Karl Mannheim’s 1923 discussion of generation as a cultural divide shaped by experiences of different historical conditions shaping different kinds of political consciousness. Initially, at least, for the educated middle classes of Shahine’s generation, stability meant affluence and security. At the turn of the twenty-first century, our epoch of stability was becoming a Dark Ages. Religious fundamentalism was on the rise. Intellectuals were being persecuted. The police were cracking down on anyone who challenged the status quo. There was nothing we could do–the whole system needed to change, but that was impossible. At least, we thought so. For this generation, then, “stability” signified something very different from the comforts and opportunities it had connoted for me and my contemporaries. It meant no prospects for the future. And when it became clear that the president’s son was being groomed to succeed his father, the prospects of another 30 or 40 years of such “stability” became intolerable. Egypt’s young generation had nothing to live for anymore, as so many of them said. Mannheim, Karl. 1952 (1923) “The Problem of Generations” in P. Kecskemeti ed,, Essays on the Sociology of Knowledge by Karl Mannheim. New York: Routledge & Kegan Paul. Shahine, Selim H. 2011. Youth and the Revolution in Egypt. Anthropology Today 27(2): 1-3.